Avowed as one of Cape Town’s most anticipated annual events, Veuve Clicquot Champagne proudly announces the return of the annual Veuve Clicquot Masters Polo Cape Town 2015. The event is a luxury lifestyle and polo affair drawing socialites, fashion cognoscente, celebrities and equestrian lovers. The Veuve Clicquot Masters Polo is a blend of fashion, the exhilarating sport of polo, fine champagne as well as Cape Town’s most elegant company. Guests are guaranteed an afternoon of audacious pleasure with a perfectly-chilled flute of champagne in hand. The riveting 10-goal polo tournament will showcase the skill of the country's top international-level players. 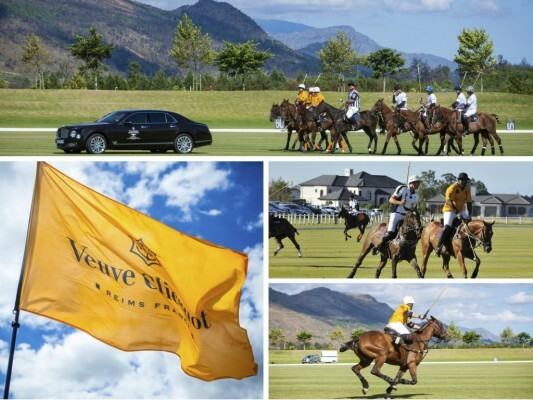 As a highlight on the South African social calendar for the fifth year, this day of splendor is set to take place in the Paarl-Franschhoek valley at South Africa’s first and only wine and polo estate – Val de Vie Estate, on Saturday 7 March 2015. Veuve Clicquot is internationally recognized for its long association with Polo and sponsors some of the world’s leading polo events such as the UK’s Gold Cup, USA’s Manhattan Polo Classic and LA Polo Classic. Drawing inspiration from polo’s global presence, the Veuve Clicquot Masters Polo Cape Town is now one of Cape Town’s most anticipated events and the only one of its kind on the African continent. Fashion aficionados can look forward to a carefully curated luxury experience as they gather on the scenic estate’s clubhouse terraces to marvel at models revealing chic summer outfits. General access tickets, priced at R850 per person, include entrance, a glass of Veuve Clicquot, food and a thrilling day of polo. General guests will be located on the sprawling grass lawn which offers the perfect space to be a polo spectator, socialize, play exciting Veuve Clicquot games and enjoy fine champagne. Polo-goers also have the option to purchase Veuve Clicquot Masters picnic tickets located on the northern side of the Val de Vie clubhouse for R150, allowing them to indulge in a chic picnic party on the side of the polo field. Both these ticket holders will have the option to visit a Veuve Clicquot bar offering champagne and non-alcoholic beverages for purchase. There is also a Deluxe Hospitality package (prices available on request). The deluxe hospitality suite is carefully designed and appointed for the ultimate enjoyment of not only the world-class polo tournament but also the thrilling entertainment and activities that make up this exciting annual event. With a dedicated butler and luxurious viewing lounge overlooking the polo pitch, guests will not only be delighted by the nail biting polo finale played but also enjoy the lavish food, décor and champagne on offer (as per package offer). Now regarded as one of the most glamorous daytime events of the Cape Town season, guests of the Veuve Clicquot Masters Polo, will no doubt take full advantage of the opportunity to step out in traditional polo style and create unforgettable fashion-forward moments. The event will start at 14:00 and end at 19:00. But it doesn’t have to end there! From 7pm to midnight, you can continue celebrating at Shimmy’s Polo After Party – a 1920’s inspired affair that will see guests effortlessly shimming down the large dance floor. Besides good music, there will be food on sale and a cash bar. 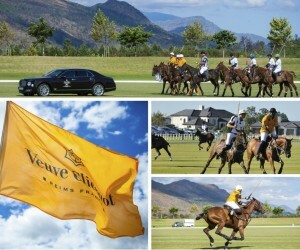 However, the party is only open to guests with tickets to the Veuve Clicquot Masters Polo. Guests of the Veuve Clicquot Masters Polo are encouraged to don classic polo looks including sundresses for women and summer suits for men. To make transportation to and from the event as easy and safe as possible. Veuve Clicquot has teamed up with Uber to provide transportation assistance. The general access parking area is a designated Uber drop-off and pick-up location, and all new users are eligible for R200 off their first ride by using the code: VCM2015. Tickets available online at Computicket www.computicket.com. For Group Bookings email info@vividluxury.co.za or call 021 465 2312. Please visit www.vcmasterspolo.co.za for more information.